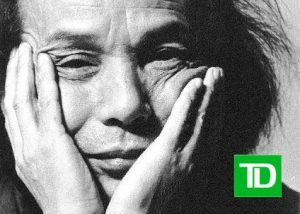 Toru Takemitsu’s (1930 – 1996) compositional idiom preserves national identity, building awareness of Japanese music and tradition through his remarkably original synthesis. His distinct sound transcends musical borders using both Western and Japanese instruments in varying combinations. Born in Tokyo, Japan on October 8, 1930, Takemitsu decided to pursue a career in composition at the age of sixteen, despite little formal training. International attention first arrived when his Requiem for Strings (1957) was hailed as a masterpiece by Igor Stravinsky. His success abroad continued to grow with scores like November Steps (1967), an innovative commission celebrating the 125th anniversary of the New York Philharmonic. At the forefront of musical experimentation during the 1960s and early 1970s, Takemitsu’s later style fused a Japanese ethos with Western techniques. The much-played orchestral work, for example, A Flock Descends into the Pentagonal Garden (1977), gained a considerable following on both sides of the Pacific. While Takemitsu wrote scores to almost a hundred films (including Akira Kurosawa’s acclaimed Ran), he may be most remembered for his extensive canon of orchestral and chamber music. The Toru Takemitsu Composition Award, an international award named in his honour, is granted by the Tokyo Opera City Cultural Foundation to young composers who will shape the coming age through new work. Toru Takemitsu’s music will be featured alongside works by Philip Glass, Claude Debussy and a world premiere by Anna Höstman in Soundstreams’ 2016/17 season opener Magic Flutes on October 12 at Koerner Hall. His Seasons was presented during the 12/13 season, performed by Fujii Percussion and Voices.